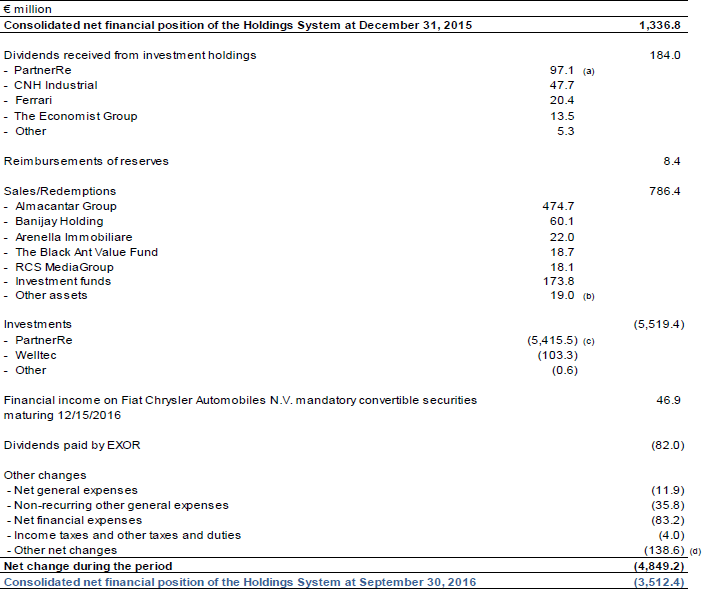 The consolidated net financial position of the Holdings System at September 30, 2016 is a negative balance of €3,512.4 million and a negative change of €4,849.2 million compared to the year-end 2015 positive balance (€1,336.8 million), mainly due to the disbursement made in connection with the acquisition of PartnerRe. Current financial receivables refer to the FCA N.V. mandatory convertible securities of €49.7 million maturing December 15, 2016. Financial payables of €605,1 million include the financing drawn down on the remaining credit line secured under the May 11, 2015 Financing Agreement between by EXOR, EXOR Netherland N.V., Citigroup Global Markets Limited and Morgan Stanley Bank for the acquisition of PartnerRe, for a total of $550 million (€492.8 million). In 2015 another credit line of $1,250 million was secured for the acquisition of PartnerRe and fully repaid on April 13, 2016. Also included are short-term loans secured by EXOR from leading credit institutions for €112.3 million. Other financial liabilities principally consist of the measurement of cash flow hedge derivative instruments (€23.6 million). (c) Of which $6,065 million(€ 5,377.7 milioni) paid to common shereholders and $ 43 million (€37.7 million) to preferred shareholders. At September 30, 2016 EXOR has irrevocable credit lines in Euro of €390 million, of which €350 million is due after June 30, 2017, as well as revocable credit lines of €558 million. EXOR also had credit lines in foreign currency for a total of $640 million (€573.4 million) due after September 30, 2017, drawn down for $600 million, of which $550 million (€492.8 million) was granted for the acquisition of PartnerRe. On October 17, 2016 Standard & Poor’s confirmed the rating for EXOR’s long-term and short-term debt at “BBB+” and “A-2”, with a “negative” outlook”.